Pull * Transition * Push * Rest (PTPR) is a ubiquitous sequence of movements, most easily recognized while breathing. 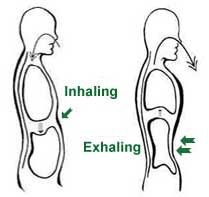 Between the Pulling of air inward and down into our lungs and the Pushing of air upward and out of our lungs, there is a Transition in which the direction of air flow is reversed. And between the Exhalation which completes one breath and the Inhalation that commences the following breath, there is a pause, or a Rest. Notice that the Rest is more extended than the Transition, which is a mere turning point. Never is there an inhalation without an exhalation. A whole life always has a whole number of breaths. Every single breath emerges from a Rest and ends in a Rest. At birth there is an initial inhalation (Pull). At death there is a final exhalation (Push). Pull * Transition * Push * Rest, or PTPR, is a sequence, hidden right under our noses, that is ubiquitous in nature. What is hidden is most revealed. Dendrites Pull neurotransmitters into the neuron, where an electrical impulse forms and travels to the cell body. The cell body reads the electrical signal and, if it has certain qualifications, the cell body will Transition the signal on down the axon. 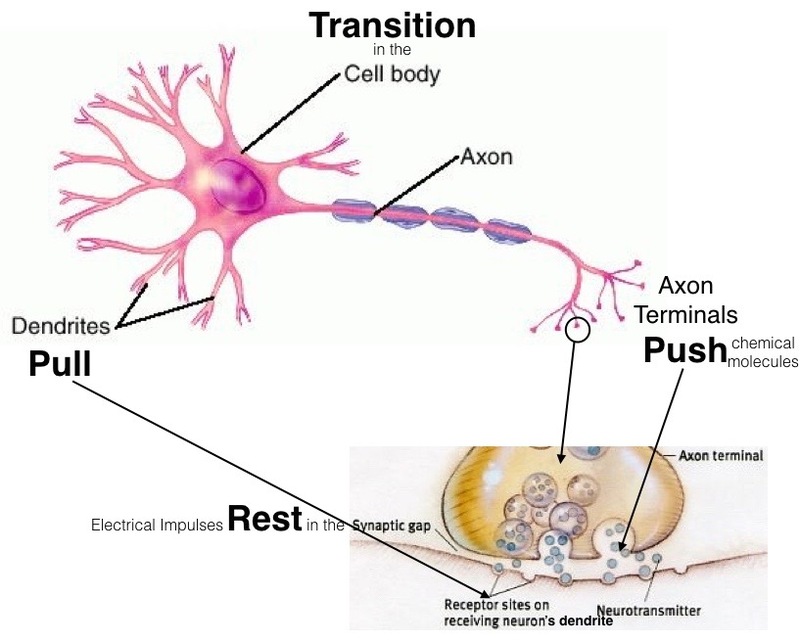 The axon terminals then Push chemical neurotransmitters out of the cell into the synaptic gap surrounding it. From the synaptic gap — wherein the electrical impulse is at Rest — the neurotransmitters will once again be pulled into nearby dendrites. Might it be reasonable to speculate that, within the plasma medium of the universe, galaxies could communicate with each other in a similar fashion? 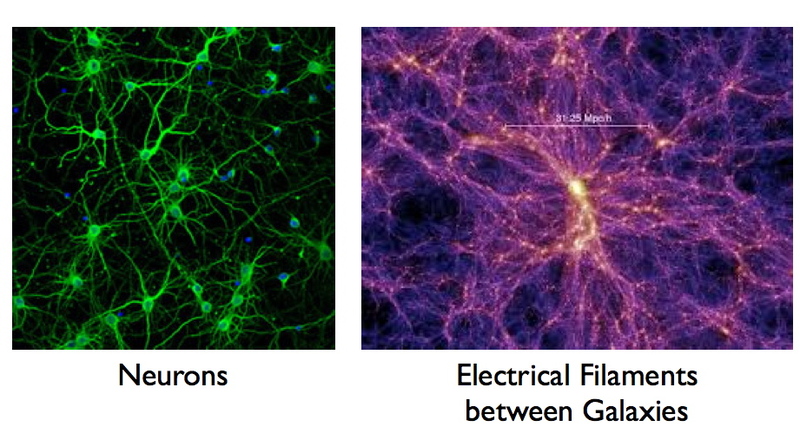 Certainly the structures of the small-scale nervous system and the vast galactic network are similar, as we see below. 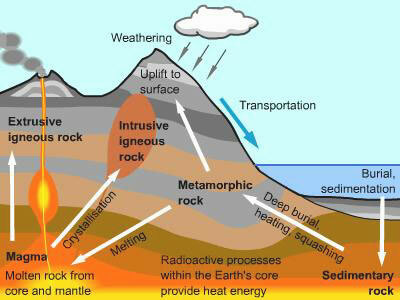 On the left, we follow the rock cycle: Rocks are Pulled downhill and buried beneath the seas. Sedimentary and metamorphic rock Transitions, through compaction and heat, into magma. The magma crystallizes and igneous rock is Pushed to the upper surfaces of volcanic mountains. Spewed from volcanoes rocks tumble to their Resting places, until the process begins again. On the right, we follow the water cycle: Water is Pulled from the earth’s surface through the process of evaporation. The clouds of vapor are the Transitional phase. Condensation Pushes the molecules together until they are too heavy to remain airborne and fall back to earth as rain, sleet, snow or hail. The precipitated water accumulates and Rests in lakes, rivers and oceans until the process begins again. We are just beginning to recognize Pull * Transition * Push * Rest (PTPR) throughout our earthly world and beyond. They go together; never is one of these actions isolated from the others. Every action, even those that seem to be random, participates in a larger circuitry of actions.